Until yesterday, Little Rascals were advertising a litter of so-called “Pedigree” Old English Bulldogs, bred by one of their ‘kennel managers’ – Catalin Banghea, who also breeds and sells Cane Corso puppies. Mr Banghea claims these puppies have impressive pedigrees, and states that the mother of the pups is registered with NEBBR (New England Bull Breed Registry). The NEBBR is an unofficial one-man operation which appears to have been set up to allow breeders who are not eligible for Kennel Club registration to register so-called ‘pedigrees’, and it allegedly promotes the responsible breeding of healthy dogs – but there is no requirement for breeders to have breed-specific health tests performed in order to be included on the NEBBR database, and no checks are carried out to verify breeders are genuine before allowing them to register. When breeders like Little Rascals and Catalin Banghea make claims that puppies and breeding dogs are ‘health checked‘ and ‘vet checked‘ it has absolutely nothing to do with the expensive blood, DNA and breed-specific tests which are associated with genuine, responsible dog breeding. In most cases it is simply a quick vet-check prior to sale (or not) and, as we all know, even that is no guarantee that a Little Rascals‘ puppy is healthy [vets]. The person running NEBBR (Mr Robinson) was asked about the legitimacy of the claims made by Little Rascals and “Emmanuel B“, in particular the authenticity of the sire and dam. Mr Robinson chose not to answer the questions, but asked for registration details of the dogs and the breeder’s name. He obviously knew the registration details couldn’t be provided without first purchasing a puppy, but Mr Robinson was told that the breeder is Catalin Banghea, who is employed by puppy farmers. 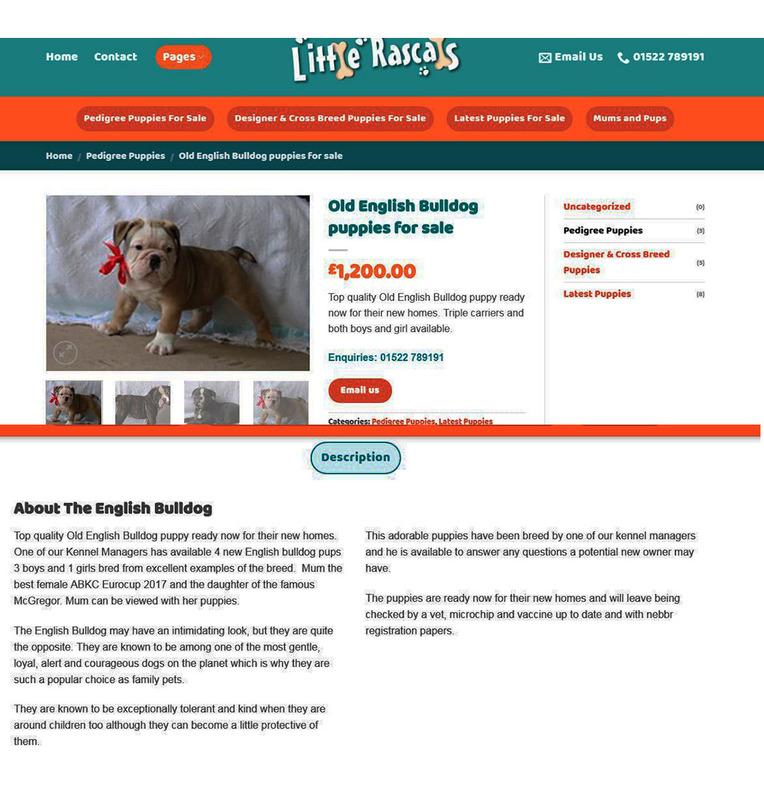 Within a few hours of contact with Mr Robinson, Little Rascals had removed all reference to the British Bull Dog puppies from their website, and ads for the puppies on Gumtree and Pets4Home were cancelled, so Mr Robinson had obviously contacted Little Rascals and/or Catalin Banghea to warn them we were making enquiries – a curious thing to do if everything is above-board. FRAUD is a criminal offence – the breeding of animals for profit, regardless how few or how many without reporting the sales to HMRC is FRAUD. Our thanks to Anne B for bringing this to our attention. NEBBR is the brainchild of Wayne ‘hotrod’ Robinson who started the business to get himself out of debt and he’s managed to achieve just that. Take into account the charges for registration and you can see why. He has roughly 9000 registrations. Bear in mind he charges £20 for a single registration, £25 for a litter but new owners fork out an extra £15 per pup to have ownership transferred. Kennel registration is another £20 a year or £50 for life, advertising is £5 per month. Add all that up and you can see how he got himself out of debt. Great business acumen if only it was a recognised official register. Its not. As you said here, its a one man band and there’s no guarantee of breed health issues being monitored or tested and he can’t physically go and check applicants out, so what you have there is just another way for someone to make money out of dog breeding. We remember that Karen, it was shocking and sadly is still going on with at least one death of a puppy in February this year, a Dachshund purchased from travellers. We wrote about your daughter’s sad experience last year [link] and reported the deaths of all the Beagle puppies to North Kesteven who actually told us that there was no reason to believe that Parvovirus existed on Little Rascals’ premises, so that gives some idea about what is really going on in the licensing department of that Council.